Supracolor Soft Aquarelle Pencils by Caran d’Ache are professional-quality, watersoluble colored pencils developed in Switzerland to meet the most exacting standards of artists and illustrators. Use these hexagonal pencils wet or dry for unlimited blending possibilities. Either way, their thick 3.7 mm cores offer exceptional covering power and excellent lightfastness. They can also be combined with Caran d’Ache Pablo Colored Pencils. 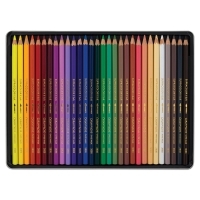 Available individually or in sets, Supracolor Soft Aquarelle Pencils are pre-sharpened. The sets, which are packaged in sturdy hinge-lid tins, make wonderful gifts. A full listing of the colors in each set is located on the Item Specs tab. Pablo and Supracolor Wood Box Set, Set of 160 — Caran D'Ache has created this exquisite wood box set for the true art enthusiast. 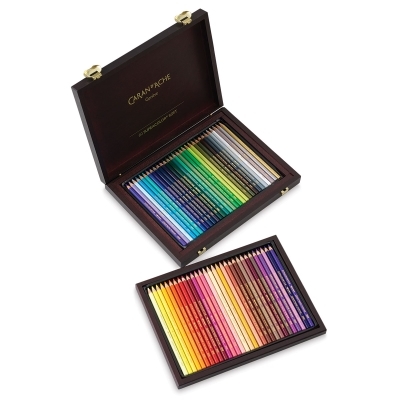 It holds 80 water-resistant Pablo colored pencils and 80 watersoluble Supracolor aquarelle pencils, which blend beautifully with one another. The pencils are pre-sharpened, with thick 3.7 mm cores and a hexagonal shape. Wood Box Set of 80 — This set is housed in a luxurious wooden box and makes a wonderful gift for artists of all levels. It includes the same colors as the Set of 80. 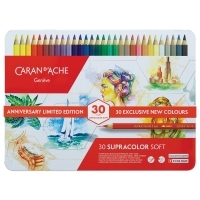 30th Anniversary Sets — To celebrate three decades of style, quality, and creativity, Caran d’Ache has added 30 exclusive new colors to the Supracolor Soft Aquarelle color palette. Choose the 30-count set to experience the new colors, or a wood box set of 60 that includes the new colors plus 30 classic colors. Every pencil has "limited edition" printed on the casing. This set contains one Pablo and one Supracolor of each color listed. Supracolor Soft Aquarelle Pencils are like having two art mediums in one! The soft core provides the option for smooth rich laydown of color and precise line drawings; or, add a wet brush and the color becomes liquid and flows like watercolor. Watch this video to see how bright and luminous these professional quality water-soluble colored pencils are. Supracolor have exceptional covering power and excellent lightfastness to meet the most exacting demands of artists and illustrators.